Karthein’s Organic Sauerkraut is obtained through the natural process of fermentation that creates beneficial probiotic bacteria. Unpasteurized Organic Sauerkraut is a new experience for most people, but it’s recorded use goes back 6000 years. Unpasteurized or raw cultured means the sauerkraut is never subjected to heat. High temperatures destroy naturally occurring digestive enzymes and beneficial bacteria such as various strains of lactobacillus. Finding new “ready-to-eat” super food that tastes great and is actually healthy is difficult. Karthein’s Organic Unpasteurized Sauerkraut is prepared the old fashioned way in labour intensive small batches. Once the jar is opened, it will last between 6 to 8 weeks. Please keep the cabbage under the brine, it will last even longer. manufacturing process is certified organic by Ecocert Canada. 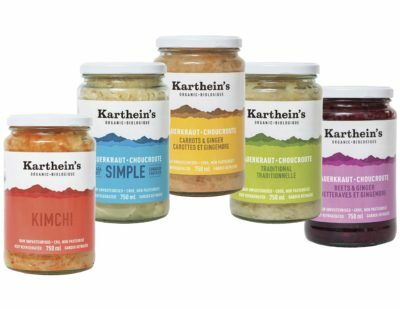 Only Karthein’s Organic Sauerkraut is unpasteurized (raw cultured) and contains naturally occurring digestive enzymes and beneficial probiotic bacteria. Try our Simple, Traditional or Carrots & Ginger Organic Sauerkraut varieties!